What is a socially responsible investment? When people think about finance they generally indirectly give for granted the dichotomy between profit and sustainability. In reality, we can find a strong link between the two and this link is called SRI, or socially responsible investment. This is part of a broader subsector of finance called ethical finance. Its main characteristic regards the allocation criteria, which are based on strong moral norms, without disregarding financial value. These criteria can be both religious, which are the main driver of Islamic finance, or laic. If they are specifically linked to sustainability we talk about sustainable finance. Some authors recognize three main parts of social finance. First, microcredit, aimed at lending small amounts of money at low rates to enterprises in the developing countries. Second, Social Banks, which produce and commercialize products prioritizing moral objectives to profit-making ones. Lastly, we can find impact investing, part of what is generally called ethical investment, the main focus of this article. But what is an ethical investment in practice? There are different strategies that allow to pursue moral scopes, seven among all officially recognized as such from authorities. The most direct one is negative screening, which is related to the exclusion from the portfolio of the ethical fund of companies that do not satisfy the ethical criteria defined by the fund or by an external authority. An active strategy is positive screening, which on the other hand defines standards that the companies have to satisfy in order to be selected to be part of the portfolio. A more technical strategy is norm-based screening, based on the selection of companies that respect business practice principles defined by international authorities. One of the most important is ESG integration, defined as the choice of companies based on ESG criteria, below specified. Then we have sustainable investing, finalized at raising funds for corporations belonging to sectors which pursue sustainable development, such as green energies firms. Impact investing, above mentioned, aimed at specific projects to solve social and environmental problems. A subcategory of this strategy is community investing, which regards disadvantaged communities or individuals. Last, we have corporate engagement and shareholder action, in which managers and shareholders go beyond the scope of pure investing, actively participating in decisions, directing them towards a sustainable development. The acronym ESG means Environmental, Social, and Governance. These are the main criteria considered to qualify a company, in order to classify it as sustainable or not. The factor taken into consideration are different: as for environment, funds look at the use of coal, green energy, CO2 emissions, climate change impact and animal protection policies; the social part is focused on the relationships with internal and external stakeholders, as suppliers, employees, community or women; governance requirements are transparent accounting standards, management of conflicts of interests and fight against bribery and corruption. But why do we care about SRI? First of all, a quite obvious explanation. The evolving situation of the planet is requiring more and more attention, both from a social and an environmental point of view. To make a moral consideration, this topic, as finance people, should be at the top of investors’ list of priorities. Secondly, this sector is in continuous expansion and requires attention because of its evolution. Lastly, there is a strong business case, meaning that the possibility to make profits is real, and these profits are demonstrated to be in excess with respect to traditional finance ones. The most direct explanation for this phenomenon is that SRI looks at the long-term instead of focusing on the short period, thus making gains more stable. We can analyze the expansion of the sector looking at the graph below, that represents the time path of its dimension, data collected by US SIF (Sustainable Investment Forum) and integrated into their last report. As it can be seen, the sector is already well developed, and it is in continuous expansion. But which are the current trends? We can analyze different tendencies in the choice of the themes which lead to the selection of companies in the portfolio of the fund. There is an increasing interest in climate change and renewable energies, driven by the worsening situation of our planet, in the eye of every concerned investor. Related to the need of the reduction of carbon emissions, we find the increasing interest in driverless cars and hybrid electric vehicles, the former being still in their research phase, the latter already diffused and increasing in number. Moreover, another important issue, at the center of investors attention, is gender diversity; this is due to the strong disparity in treatment of the sexes in the workplace, especially in terms of compensation and possibility to reach top positions, being the career path strongly influenced by gender. Always related to governance issues, we find digital security and cybercrime protection, because of the diffusion of smartphones and the development of technologies, that lead to a quicker and wider circulation of data. Focusing on healthcare and food production sectors, organic food is more and more present in the mind of the fund manager, as the major trend in the field is the desire for vegan, biological and healthier products. The funds which base their portfolios on sustainable criteria are called ethical funds. There are different examples of financial companies that deal only with this kind of investments, such as the Italian Etica Sgr, and of companies that integrate their traditional asset allocation activities with ethical investment. Lately, the vice-chair of Allianz GI Elizabeth Corley announced the willingness of the firm to further improve the already well-developed UK sustainable market, estimated to be worth £150bn. Partners group, the second largest private equity group by market capitalization, has launched a $1bn impact fund, aimed at investing in projects in line with UN development objectives, based on sustainability. The choice to start such activity is due to the increasing demand for this kind of investment, which is pushing traditional financial institutions and companies to integrate more and more ESG criteria implementation in their agenda. As far as regulatory development is concerned, the European Commission announced the intention to introduce a legislation that compels institutional investors to take into consideration sustainable criteria in the process of capital allocation. There are different concerns about this proposal because many experts do not consider the market ready for a compulsory inclusion of products that, in their opinion, are not well defined yet. Another problem could be the capital requirements associated with the choice of investing green, that could put different banks in trouble. But, as it is said, every cloud has a silver lining and green investments could be a way to make the bank more sustainable and safer at the same time, thanks to the compulsory improvement of capital ratios. 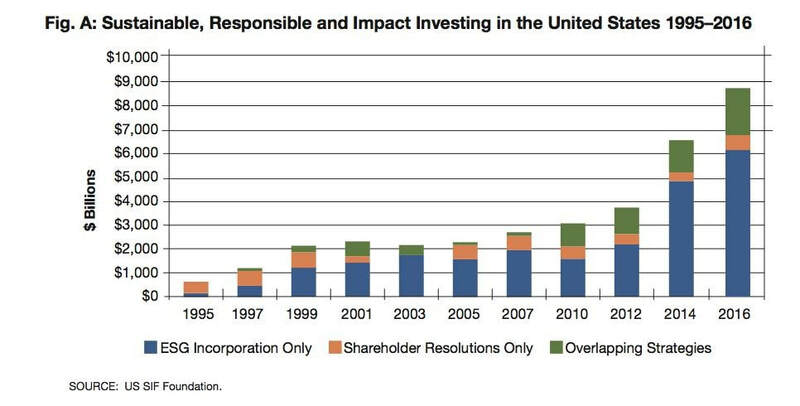 In conclusion, Socially Responsible Investing should be considered both from ethical and economical sides, as it tries to intervene into and improve the worrying situation regarding environment and society, and as it is in continuous expansion, offering investors the possibility to make profits. SRI is, therefore, the concrete chance to do well by doing good.